When we hear about caregivers abusing patients it usually has to do with elderly abuse. There is a big part of this abuse we haven’t talked about. Caregiver-inflicted abuse can come from anyone, at any age, and can take many different forms. The abuse inflicted by a caregiver can be incredibly difficult to notice. Frustrations are high when dealing with the illness and sometimes that can lead to excusing unacceptable behavior. Emotional abuse may be even more difficult to recognize. Often the chronically ill person feels like the caretaker is doing them such a huge favor that they could never complain about how they are treated. Why wouldn’t we? We are constantly told we are lucky for having friends or partners in our lives. Unfortunately, I speak from experience. I consider myself an intelligent person and I knew what red flags to look for. I thought I knew better; I would never find myself stuck in an abusive relationship. But anyone can fall into an abusive relationship, especially when they feel like they don’t bring much to the table (like many of us with chronic illnesses). When I moved across the country a couple years ago it was really hard to function without support. I felt incredibly alone. At one point, I paid a cab driver to be my ride home after surgery. I was living in cheap hotels, in my car, or on couches; I was also really struggling with handling my health. Then along he came. He didn’t treat me like a sick person. He treated me like an equal, at least in the beginning. It was wonderful to have someone else help to face the struggles of illness face on. The abuse started gradually. Small threats, constantly getting mad at me, and insults became more and more common. He was constantly making me feel guilty for being sick and even claimed I was faking it. I had no one else and he was helping me some with day-to-day life so I just didn’t even recognize the warning signs. After all, I felt like a burden to all my loved ones anyway. He was just confirming what I already thought. In my mind, this messed up relationship was exactly what I deserved. I finally began to see the problem when he had a problem with me trying to make friends and began to steal from me. Even then, it was hard to leave because I relied on his help so much. I made excuses. It is hard to date me, dealing with illness is hard, he isn’t bad all the time. I tried to break up with him a couple times, but he convinced me to go to couple’s counseling and scared me into staying with him. Looking back there was an abundance of warning signs. He put his fist through a microwave because I didn’t feel well enough to clean it out. He broke the trash can because I couldn’t take out the trash. He refused to close the blinds when I had a migraine. He refused to let me keep the apartment cold so as to not faint. He threw me on the floor when I didn’t dry off in the shower to his liking. He left me stranded without a ride on multiple times, once over an hour away from home. I had to limp miles in the snow at more than one point. He locked me out of my apartment. The warning signs may seem obvious, and they are now looking back on that time. However, it took me nearly having to die before I did finally recognize him as abusive. One night he drank too much, pushed me off the bed onto my head and gave me a concussion after trying to strangle/kill me. I was able to claw at him with my nails enough to get away, but still lost consciousness. I’m sure he still has scars. It was one of the most terrifying things I’ve ever gone through and he was the only person I had in my life at the time. The concussion was so severe I had to withdraw from school. I could have died that night, and I truly wished I could have seen the big picture before getting hurt. You are not a burden. You can enrich the lives around you, illness or not. You deserve supportive and loving relationships even if you are sick. Do not stick with anything less. 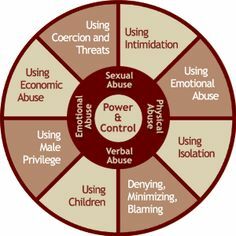 Emotional abuse can be as damaging as physical abuse. It should never be ignored or excused away. You don’t deserve to be threatened, hurt, or mistreated by anyone just because you are sick. You don’t deserve to feel guilty over feeling sick when you’re unable to control it. If you are in an abusive relationship do not bother with couples counseling. Abusers won’t be honest or work on their problems. Everything will be turned on you as if it is your fault. Couples counseling made my partner more violent and convinced me further that I deserved to be a victim to his bad behavior. Ending up with an abuser is not your fault. It is difficult to not feel stupid for getting into the situation, but it can happen to anyone. It is more likely to happen to you if you have a disability. What you go through is your abuser’s fault, not yours. However, make sure you don’t allow yourself to remain a victim out of embarrassment when you finally do see the signs. Don’t stay with an abuser because you are worried about being alone or taking care of yourself. Being alone is hard, especially with a chronic illness, but it is definitely better than getting hurt or nearly killed. You aren’t alone in your struggle. If there aren’t friends or family you can reach out to there are online and in- person support groups. There are also counselors who work with chronic illnesses and abuse that can help you recover. Shelters are an option if you have no one else to turn to. For more information or to speak to someone right away the domestic violence helpline should be able to help: thehotline.org or 1-800-799-SAFE. It isn’t easy to get away from an abusive relationship, but it will be so much better for you and your health. If you see the warning signs or red flags that your caregiver is abusive talk to someone you trust and get away from them as soon as possible! Caregiver-inflicted abuse doesn’t have to come from a romantic partner. It may come from friends, parents, and even health care professionals as well. No one deserves this abuse and you should never stay in an unsafe environment because you feel like you deserve it. Today I want to give up. It happens every once in a while. Chronic pain is a fight you never get breaks from. It is all day every day, and lately for me it has been all night every night. Pain and lack of sleep have left me feeling incredibly discouraged. Sometimes I feel as if being in pain for this long warps my thoughts. All I want is a break from the pain. It is easy to want to give up when you can’t even get a break from pain while sleeping. Additionally, I don’t feel like I can talk to anyone who usually supports me. I don’t feel like I am allowed to do anything than fight this every second of every day. I don’t feel like I am allowed to feel anything other than hope and inspiration. I don’t feel like I am allowed to be this discouraged. When you feel like giving up feeling isolated is one of the worst things you can add to the mix. I know I won’t give up. I know that I will push through because I always do. It would be really nice to not feel so alone in this feeling right now. In the past, as I’ve talked to people around me about these feelings I have noticed a pattern. They listen long enough to get scared, shame me for feeling this way, and change the subject. I understand that is an uncomfortable subject. I really do, but when you respond in this manner the next time I feel this way I won’t feel like they can talk to you. That is where I sit today. So I am here to tell you what I desperately wish someone would have told me a long time ago: there is nothing wrong with feeling like you want to give up. The important thing is that you don’t give up. Do not shame us for feeling this way. So many of us have to fight so hard every day- against pain, loss of friends, loss of social life, and loss of our healthy self. It is okay to feel tired from this battle. When you shame your loved ones for feeling this way you guarantee that they will not talk to you the next time they feel this way. That is the very worst time to feel alone. You can remain supportive and positive without shaming them for feeling this way. If you do this then your loved one is more likely to seek out you to talk to rather than some terrible alternatives. Don’t see this feeling as weakness. Wishing you could give up isn’t a moment of weakness; it is expected when you are fighting an uphill battle against your own body. A lot of the time we aren’t looking for a solution. We just want support- someone to talk to. You don’t have to know the perfect thing to say. Sometimes you don’t have to say anything at all. Sometimes a hug or shoulder to cry one is the best thing you can do. Let us feel the full extent of our feelings. Crying, screaming into a pillow, and cursing out your illness are all things we need to do sometimes. Let us feel all our feelings without judgement. Get frustrated at the illness, not your loved one. Dealing with chronic illness can be frustrating to the patient and those around us. You don’t have to be a saint and never get frustrated. Instead, direct the anger at the illness and not the patient. When they come to you frustrated you will be able to support them better and relate more to their struggle. When you tackle the problem together and see it as an obstacle to work through instead of a problem with your loved one you are much better at supporting others. Because you and your loved one are fighting the same battle (in obviously very different ways), you are often the one best equipped to understand and support. You probably have similar frustrations with your loved one’s illness. Use this to relate and empathize, but do not make their struggles about you. It is not your responsibility or your fault your loved one feels this way. You aren’t expected to support us alone. Sometimes you will need help and that is okay. If these feelings in your loved one are ongoing they might need therapy. Don’t demand they go. Suggest it and tell them how worried you are about them, how much you care about them, and that you want to continue to support them but you can’t do it on your own.